"Friendly" Competition that Yields Results for the Community - JP loves LIFE! After talking to Ray Prock and Jeff Fowle for months through twitter, I finally met the dairyman and rancher in January and it surprised all of us as we seemed to be dear friends for years. The two of them put such incredible time and thought into growing their communities on twitter still that it leaves me in awe. But it also makes me laugh. To say Jeff and Ray are competitive is an understatement. They are great friends who will point out who tweeted a comment from a meeting they are both in first or who has had the ability to connect with more people through twitter. Both of them are nearing the 10,000 follower mark. In fact, both seem to be likely to hit that mark during Food Check Out Week. And both have announced they will celebrate that accomplishment with contributions of food to people in their immediate communities. I love it! The two of them focusing on giving back to their communities make me want to follow each of them 5 times! 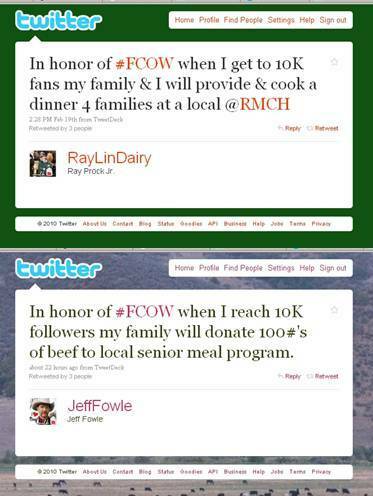 Ray and his family will spend time cooking for residents of a nearby Ronald McDonald House Charity (he wrote a short blog post on it) and Jeff will donate a hundred pounds of beef from his ranch to a local program that helps feed senior citizens. Earlier this weekend, a both of young farmers and ranchers helped stock a food pantry by packing pallets of food for a chairty while they held a meeting in Tulsa. Will Gilmer tweeted several photos of the work between his own work on the project. You can get to the photos through his twitpic page. On Saturday, members of the Ag Relations Council (waiting anxiously for the site redesign) including my friend Mace Thornton, built a fence for someone who’s husband is deployed. On Friday as I talked to Mike Haley, I learned he was actively involved in the leadership of his local humane society. And he supports it financially as well. Regular mentions of calls for volunteer fire departments seem to interrupt the regular lives of farmers like Steve Tucker and Troy Hadrick. Darin Grimm helps out on the board of a local private school. And the list could go on for days! So I’m enjoying stepping back to look at the number of peoples lives they make better, whether that is by sharing information online, growing the food that other of us purchase in grocery stores and restaurants, or by doing volunteer work in their communities. The thousands of followers that Ray & Jeff havce each built is a drop in the bucket for the millions of us who benefit by having farmers focused on others. And on this Sunday morning, it seems I should certainly take time to thank a farmer. I’m betting there will be plenty joining me really soon whether they pop up online or not, especially the folks benefitting from this friendly competition. By the way, if you are a farmer who volunteers in your community, I’d love to add you to my thank you list! Just let me know! Congratulations! I am happy for your achievement. Let us continue to strive to spread the positive message of agriculture and share in our mutual support of local humanitarian efforts. Have a blessed day! By the way, 25,000 is the next milestone! Delighted to see both Guido and Tinkerbell are vying to spread the ag love through SM! great article, wonderful to hear that folks out there are working to keep their communities alive and good job to you for giving recognition to them!